The arrest of one of the West’s most prominent Muslim war on terror critics is almost certain to further stifle political activism within the Muslim community and more broadly as well. 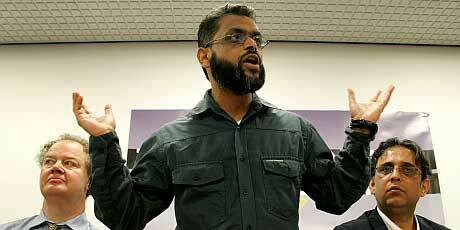 Moazzam Begg, a native-born British citizen of Pakistani descent, spent three years incarcerated in the most notorious detention camps created in the post-9/11 “War on Terror”: all without ever being charged with any crime. Arrested in Pakistan in 2002, he was transferred to Bagram Air Force Base in Afghanistan, where he suffered torture and witnessed US interrogators beat an innocent taxi driver to death, and then onwards to Guantanamo Bay where he would be detained for the next three years in conditions he’d describe as “torturous”. On Tuesday, Begg was arrested in an “anti-terror raid” on his home outside Birmingham, charged with “terrorism” offenses for having allegedly traveled to Syria to assist Syrian rebels. He was among four other people arrested that day, all due to Syria-related offences. Curiously, however, Begg’s last visit to Syria was in the relatively distant past. He visited the country last in December 2012 — for what he said were advocacy purposes and to continue his investigation on torture victims renditioned to the country by Western intelligence agencies. Several individuals of Syrian descent were notoriously renditioned to the Assad regime by the US for interrogation and torture, including the Canadian citizen Maher Arar, whose treatment resulted in a formal apology from the Canadian government and compensation of close to $10 million. [I]n October 2012, I was called by an MI5 officer who said they wanted to talk to me about my views on the situation in Syria…I agreed to speak to them and meet at a hotel in East London. Both MI5 and I had our lawyers present. At the end of the meeting I was assured by MI5 that my proposed return to Syria to continue my work would not be hindered, and it wasn’t. This raises the obvious question: if the British government had concerns about his involvement with militant groups in Syria, why did it specifically meet with him to green-light his trip there? Furthermore, if his arrest was related to his December 2012 trip, why would the government wait more than a year to arrest him for it? That’s all independent of the bizarre spectacle of charging someone with “terrorism” offenses for allegedly helping rebels which the US government itself is aiding and for whom intervention was advocated by the US president as recently as last year. Indeed, in 2012, the year Begg made his trip, the widespread view in the West of Syrian rebels was that they were noble freedom-fighters who deserved as much help as possible, not “terrorists” whom the law made it a crime to assist. In the same year another major visiting supporter to the opposition movement was John McCain – an indication of how much mainstream Western support the uprising enjoyed at the time. Begg has long been a vituperative critic of the British government’s conduct during the War on Terror but throughout this time he has always been a public figure under constant media and government scrutiny. The notion that he’d be able to engage in terrorism surreptitiously on a trip sanctioned by MI5 — then hide this for over a year — seems dubious in the extreme. This explanation is all the more credible given the exploitation of terrorism charges by both the US and UK governments throughout the post-9/11 era. There has been a consistent attempt by government authorities to stifle political activism among those criticizing civil rights abuses as well as foreign military expansionism. Predominantly, the brunt of this suppression has focused on Muslim minority communities in the West. The No Separate Justice campaign, along with the National Coalition to Protect Civil Freedoms, have documented numerous cases of Muslim political activists who have been arrested and detained for their public criticisms of the conduct of the War on Terror — usually under the guise of highly-tendentious terrorism charges. Individuals such as Tarek Mehanna, Fahad Hashmi, Jubair Ahmad, Emerson Winfield Begolly, and others have come to the attention of authorities for their highly public expressions of dissent, charged with terrorism, and then handed long prison sentences under extreme circumstances of incarceration rivaling those at Guantanamo. The largest civil rights organization in the US, CAIR, was smeared by the DOJ in 2003 as “an unindicted co-conspirator” in a terrorism case (but given no opportunity to contest the innuendo), while the nation’s largest Muslim charity was prosecuted on terrorism charges for the crime of sending money to Palestinians deemed terrorists by the US Government. Federal courts in the US, and to a lesser extent in the UK, have been subservient in the extreme to national security claims by the government, all but ensuring that accused Muslims are convicted even when the evidence is at its flimsiest. All of this, coupled with widespread community surveillance, has sent a message that aggressive political dissent among Muslims will not be tolerated and can easily be criminalized as “terrorism”. While government suppression of activists usually begins by targeting unpopular minority groups such as Muslims, it is clear that the dragnet is already beginning to expand, as exemplified by the recent threats and detentions of journalists, whistleblowers and other activist groups under terrorism laws. The arrest of one of the West’s most prominent Muslim war on terror critics is almost certain to further stifle political activism within the Muslim community and more broadly as well. Utilizing extremely dubious terrorism charges against domestic dissidents has been a hallmark of the national security state in the post-9/11 era. That such tactics are commonly condemned when implemented by authoritarian governments such as China, Egypt and Russia – and yet enthusiastically implemented at home with little objection – exemplifies the corrosive measures and accompanying mentality which are undermining the foundations of Western freedoms.